PSA and USIP held a small round-table discussion on recent events in Syria and their effect on global security featuring Fred Hof, senior fellow with the Atlantic Council’s Rafik Hariri Center for the Middle East and former Special Representative on Syria, and Steven Heydemann, Senior Adviser for Middle East Initiatives at USIP, on Feb 1st, 2013. Frederic C. Hof is a senior fellow with the Rafik Hariri Center for the Middle East. On March 28, 2012 President Obama conferred on Amb. Hof the rank of ambassador in connection with his new duties as special advisor for transition in Syria. Amb. Hof was previously the special coordinator for regional affairs in the US Department of State’s Office of the Special Envoy for Middle East Peace, where he advised Special Envoy George Mitchell on the full range of Arab-Israeli peace issues falling under his purview and focusing on Syria-Israel and Israel-Lebanon matters. He joined the Department of State in April 2009 after serving as president and CEO of AALC, limited company, an international business consulting and project finance firm formerly known as Armitage Associates LC. Steven Heydemann, Ph.D., serves as Senior Adviser for Middle East Initiatives at the United States Institute of Peace (USIP), an institution created by Congress to prevent, mitigate, and resolve violent international conflict through nonviolent means. Since December 2011, Heydemann has directed the USIP-facilitated The Day After Project that brought together some 45 Syrian opposition leaders to develop principles, goals, and recommendations for the transition to a post-Assad Syria. 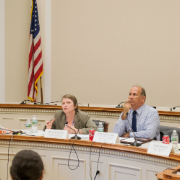 This was the third event of the PSA/USIP Congressional Briefing Series – topics on International Conflict Resolution and Prevention, an educational program designed to provide congressional staff opportunities to engage with leading experts and fellow Capitol Hill staffers in bipartisan forums. The program aims to build cross-party relationships, encourage bipartisan dialogue, and equip staff with new perspectives on critical issues in the international conflict resolution and prevention field. Click here for Amb. Hof’s full bio from The Atlantic Council. Click here for Dr. Heydemann’s full bio from the United States Institute of Peace.